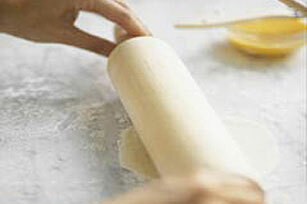 Here is a basic empanada dough that will become your go-to recipe for savoury or sweet empanadas. Combine flour, baking powder and salt in large bowl. Cut in shortening with pastry blender or 2 knives until mixture resembles coarse crumbs. Gradually add water, stirring until mixture forms ball. Place dough on lightly floured surface; knead 5 min. or until smooth and pliable. Wrap tightly in plastic wrap; set aside while preparing empanada filling. Prepare as directed, mixing 1/2 cup sugar with the flour, baking powder and salt. Dough can be prepared ahead of time. Wrap tightly in plastic wrap and refrigerate up to 2 days. Remove from refrigerator about 30 min. before using as directed.